lives an works in Tripolis. “This sign here, well that’s a half moon – but the full moon’s only hinted at,” a youth explains to whom I’ve shown a watercolor by Ali Ezouik. 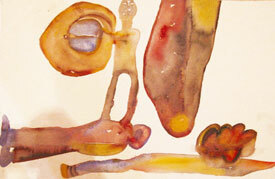 Or, is a fruit, a shell (see watercolor 1, on the left)? The delicately outlined circular form, filled with a light blue and crimson, floats powerfully above a sleeping figure, and between the two there’s a flower. The colors of star, flower and figure reflect each other. A golden yellow on the contours of the reclining woman, here and there bright lights occur. It’s the dreamer’s easiness that fascinates me, the metamorphosis, the power of which seems to make all forms participate in each other; forms that could break up at any moment now, give in into a new form. It cannot be the colors alone, there must be lots of energy that forms things and signs and makes them shine. 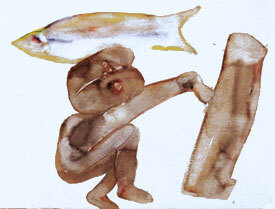 Ali Ezouik’s works are the fruits of a long and arduous road. After having broken with earlier phases of creation a long period of crisis, of menacing burn-out follow. All the while strong powers were at work, mutating and focusing an all-embracing knowledge, academic elements and tradition. And now, there’s everything out, presented as unmistakable, authentic painting, “with intimacy, strong emotion and yet rather ascetic as to the purity and freshness of colors,” as Ali Ezouik elaborates. He’s succeeded in breaking through from the inside to the outside. All channels are wide open. Now, even the light is flowing and runs through a world of signs in all directions: from an organ-like patch to a fruit, from the organ to the flower, from the plant to the figure, from the torso to the vessel. The artist dishes up plentifully. Could be a banquet; in any case, hospitality par excellence. 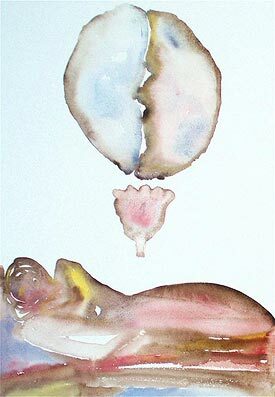 Another picture (watercolor 2, see on the left hand side): a reclining figure out of the chest of which grows another figure. This one’s grown together with a blue-golden fruit (or is it the globe?). Next to it a big, dark sign formed like a fruit with red and yellow dots. At the bottom of this scene there’s a knife with a rainbow blade the tip of which is glowing. And a flower-like form’s growing out of it. Here, one thing grows out of the other one, is linked in color and form. When following this process in my thought, I’m arriving in the midst of some nature-like excessive growing. Everything becomes nature, paradisiacal. The knife in the work of the artist testifies to existential boundaries, proven in the context of the heart, for instance, appearing as a sign and an organ. The blade cuts up the body, “opens it up”, the way anatomy and surgery has practiced since Vesalius’ times. Here, the artist does the same: he “opens up” and, from his experience, makes accessible foreign worlds that have remained closed to us so far. The heart, well the whole figure turns into a fruit that’s being prepared. 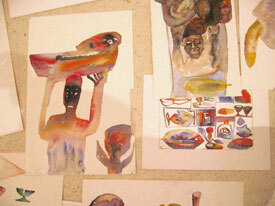 And that’s not all: the woman with the fruit basket on top of her head (watercolor 3, see left hand side) turns, in the following watercolor, into the woman carrying the child’s basket. The scarlet red, the pink in the basket of the child flows above the head into the figure’s chest and on to a blue streaming in the stomach. Including the possibility of a vice versa. 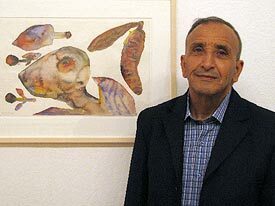 Ali Ezouik is a painter, staying with his pictures. We might as well call him a “rainmaker” in the deepest sense who knows how to link the inside and the outside, top and bottom. In his world the tables are abundantly set with rare fruits – complementarily set in their colorfulness. To eat from them means to become whole.